Earlier this week, I took time off from work to take my daughter to her annual check-up. I’m a lawyer for immigrant youth, so time with my daughter was a break from answering questions from friends, colleagues, clients and reporters about the Trump administration’s policy of tearing immigrant children away from their parents. My daughter left the pediatrician’s office feeling lucky to get an Avengers sticker. I left the office feeling lucky that I still had my daughter. It’s no longer a secret that since early May, the federal government has separated more than 2,300 immigrant children from their parents after crossing the Southern U.S. border. No law required the government to separate families. Terrorizing children and parents of color was one part of President Trump’s strategic plan to end immigration and energize his supporters. Don’t be fooled into thinking that Trump’s executive order ending family separation is anything but a sham. The true goal is to pave the way for the next line of attack: increasing family detention. In the coming weeks, the government will place parents and children in for-profit prisons; although children will be with their parents, they will still be behind bars. Thursday, Mayor de Blasio joined a group of U.S. mayors at one of the Texas detention facilities to protest this inhumane treatment, because most of the parents and children who are separated remain in facilities near the US/Mexico border. Let’s not forget, though, that the fight is happening here too, and that there are many things that New Yorkers can do locally to right this wrong. Separating families at the border is only one aspect of the Trump administration’s current crackdown on immigrant children and families. Every day, New York City’s families are being torn apart as immigration agents arrest, detain and deport undocumented parents. You can get trained by the New Sanctuary Coalition to accompany immigrants when they “check in” with immigration enforcement and attend immigration court hearings. On June 30, people across the nation will gather to protest the government’s separation of immigrant families. 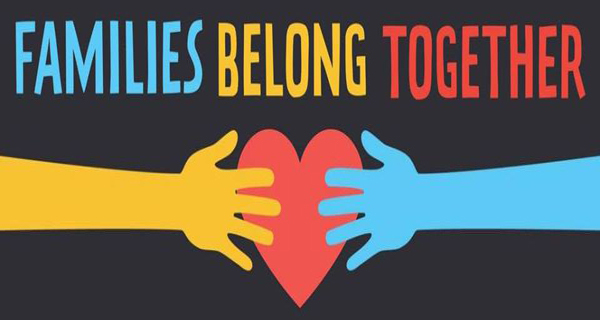 You can get up-to-date information about New York City’s march at https://www.facebook.com/events/402075813606761/ and FamiliesBelongTogether . Did you know that no one has a right to a lawyer in deportation proceedings — not even kids, no matter how young they are? The government forces them to represent themselves in court unless they have money to hire an attorney. Consider supporting one of the ICARE Coalition members — a group of New York City not-for-profit legal services providers who represent children and families in deportation proceedings: Catholic Charities, The Door, Central American Legal Assistance, The Legal Aid Society, Kids in Need of Defense and the Safe Passage Project. Or, give to the New Sanctuary Coalition’s bond fund. Each dollar you give helps get a parent out of detention and back to his or her family. Do you belong to a faith community? The Interfaith Immigration Coalition has on-line toolkits to help you mobilize your religious community to support immigrant families. If you want your voice heard, vote in upcoming primaries, because New York City elections are often determined by primary winners. On June 26, there are party primaries in six U.S. congressional districts in all five boroughs. Vote again in the New York State primaries on Sept. 13, and in the general election on Nov. 8. You could also contact your state elected officials to tell them you want New York State’s DREAM Act, which would allow undocumented students to access state financial aid for college, to be passed this year as well as the New York State Liberty Act, which would strengthen protections for undocumented immigrants. Stotland is director of legal services at The Door.